Seen below is a video that shows how just a moment of little carelessness increases the risk of an accident. 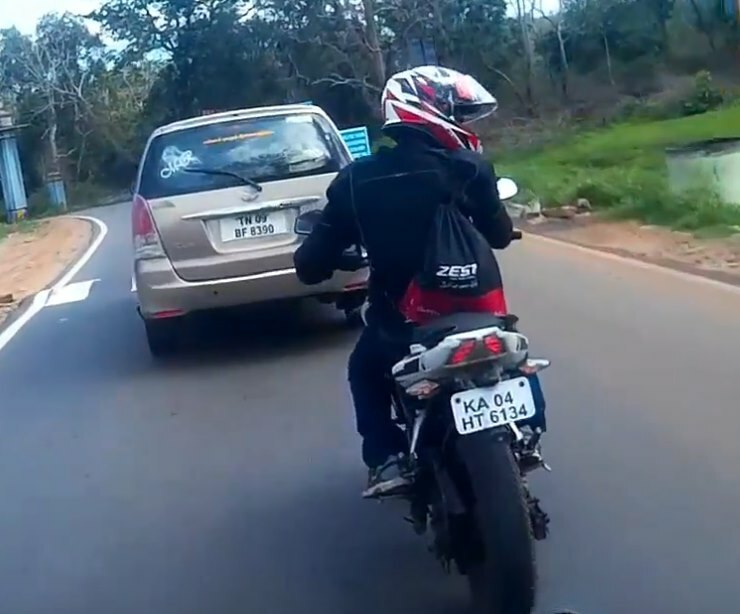 This video shows a couple of two-wheelers riding behind a Toyota Innova. The MPV and the two two-wheelers can be seen doing speeds of roughly 15-20 kmph over a well-paved divider-less road. While we are really happy that no one got hurt, the carelessness of the Pulsar-rider can’t be ignored. As you can see in the video, the motorcycle rider is distracted just moments before the crash took place. He can be seen looking towards his right, as is obvious from the direction his head is turned in and turns his focus back on the road hardly a second before the Innova decides to shed some speed before approaching a speed-breaker. By then, it’s a bit too late for the Pulsar-rider to avoid contact. His motorcycle hits the Innova and the impact is enough for the rider to momentarily lose his balance. The driver of the Innova doesn’t stop to take account of the situation, maybe because the crash was a really minor one. Or may not have even noticed this little incident behind him. However, getting distracted for a second is something that would give you no trouble at all 99% of the time. And we get into the habit of casually looking around while riding or driving. And then one day, something in your luck changes, and that one second is all it takes. Even the Bajaj Pulsar doesn’t suffer any sort of damage. However, this video goes on to show the risks that are involved while riding a two-wheeler. Things can get really grim when higher speeds are involved. A report by the Ministry of Road Transport and Highways shows that road accidents killed 150,785 people across India in 2016. Out of these, 52,500 fatalities involved two-wheeler riders. Hence, it gets really important for every two-wheeler rider to be extra-careful on the roads. As can be seen in the video, a little carelessness is all that it takes to get involved in a road accident. We urge all our readers to ride responsibly.